Made of solid, sturdy aluminum, Weston�s double deluxe burger press (model 07-0701) is a high-quality essential tool for your busy kitchen. Easy to clean and rugged enough to survive years of regular use, this handy device allows you to produce perfectly-sized and -pressed commercial-quality burgers at any time. 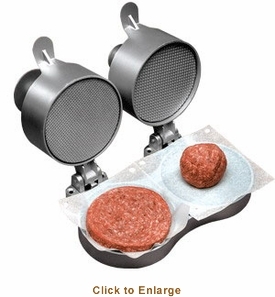 You simply put your two premade balls of hamburger on patty paper and place them on the two patty-shaping trays � once you close the lid and press down the two patty-presser buttons down you�re all done, with the result that you now have two perfectly-formed burger patties. Burgers made this way eliminate the danger of overly �fat" burgers that are underdone in the center, as well as the dreaded "thin" burgers that self-destruct when the chef tries to flip them. 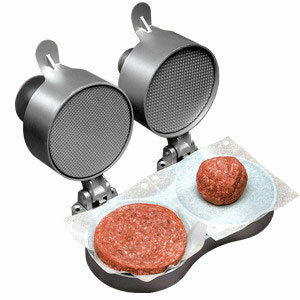 You can set patty thickness to your tastes with a range from .25� to 1.5� ��which means this patty maker is also great at producing crab cakes, stuffed burgers, and sausage patties.